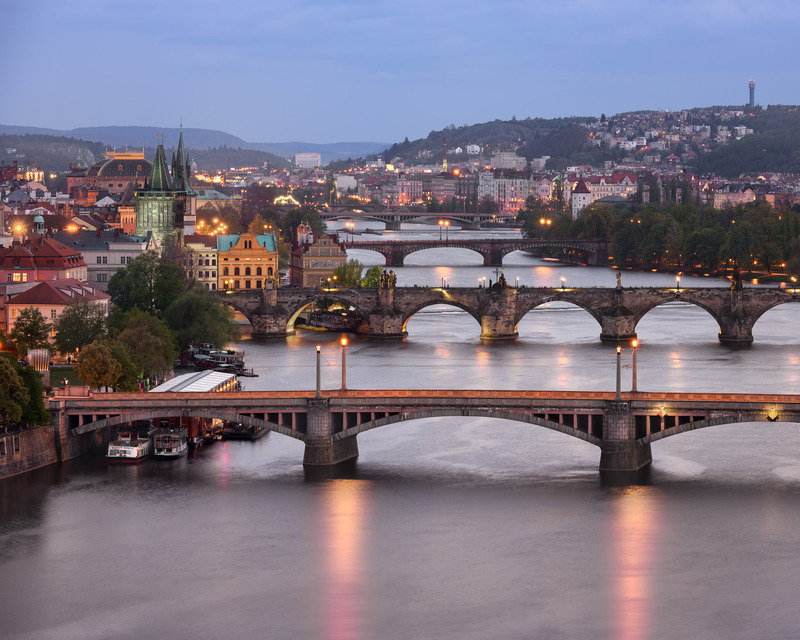 Like many of the world’s great cities, Prague was built on the water. From its earliest history, the city was shaped by the Vltava, a beautiful and sometimes violent river. Less well-known than the Thames in London and the Seine in Paris, the Vltava is no less lovely and no less storied. April 2017, single shot, additional exposures for highlights, focal length 116 mm, aperture f/8, shutter speed 30 seconds, ISO 64, tripod. There’s a reason that many photographs of Prague feature the river; it’s a singularly beautiful river, and the ancient spires and walls of Prague, when reflected in its waters, make a breathtaking sight. The river divides the city in two and offers the most splendid views of the city, views lovely enough that Smetana, one of the country’s most acclaimed composers, wrote a symphony in praise of the river. I thought I was charmed by the city when walking its cobblestone streets and its ancient alleys, but the most romantic views of the city, I found, were high above it, overlooking the grand river. The pastel-colored buildings and church spires that line the river’s banks are even lovelier when seen from above, their reflections glittering in the water. For most of its history, the Vltava has been languorous and reassuringly low. But its beauty can conceal a devastating power. At several points in its history, the Vltava has flooded its banks, inundating parts of the city and weakening its iconic bridges. The most destructive of those floods occurred in 2002, damaging large parts of the city as well as the beloved Charles Bridge. But on an evening in early spring, it was difficult to imagine that element of the Vltava’s character. It was not menacing; I could sense nothing of its sometimes violent past. Instead, it was graceful and placid, its waters bathed in the lavender light of early evening, reflecting the lights of the city I’d come to love in a short time. I framed the shot, hoping to capture even a bit of the beauty of that ancient city. This entry was posted in City and tagged Charles Bridge, Czech Republic, Prague.